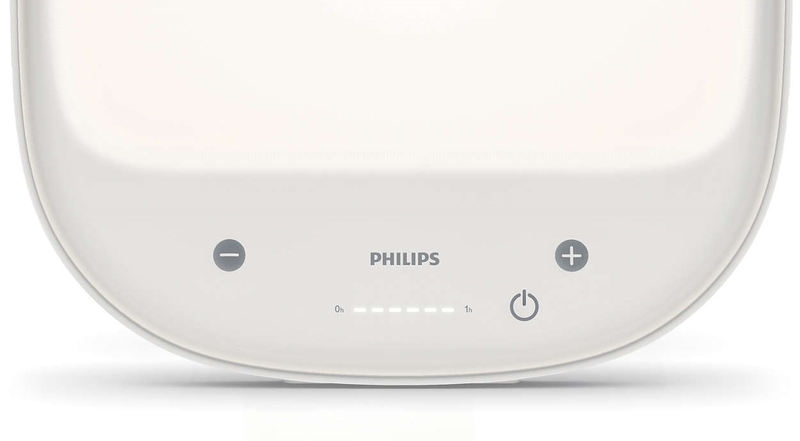 The Philips HF3418/60 Natural Energy White Light lamp has a lot of positives and is made by a world leader in health and technology. Outside of the portability factor and the rather average lux output, it’s a very good lamp. I was really impressed with the coaching app that you can use with the device. It tracks stats such as your mood to determine how effective your treatments are being. With, five vastly different brightness settings, and the brand name that you know you can trust. The price is a little high, meaning it is not the best value for money. 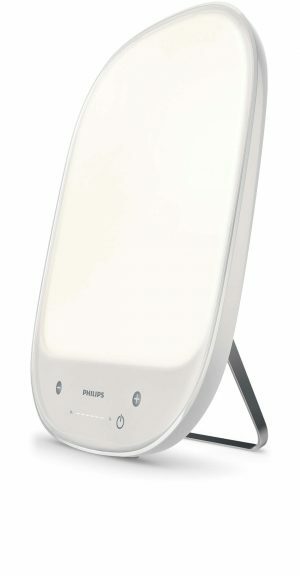 Medical grade light therapy lamp developed with Philips’ Clinical Sleep & Respironics and 100+yrs of Lighting expertise. 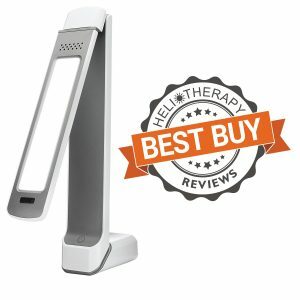 Light therapy lamp clinically proven to increase energy levels, mood and sleep to help you to stay sharp. Natural treatment for Winter Blues by simulating the blue sky on a sunny day. Philips energy light comes with 90 Day No Hassle Money Back Guarantee from Philips. Results in just 20-30 min/day use while reading, working. Slim, modern design with an adjustable angle for optimal comfort and a wall mounting option. Five (5) light intensity settings and includes free app with tips and hints for ideal use. 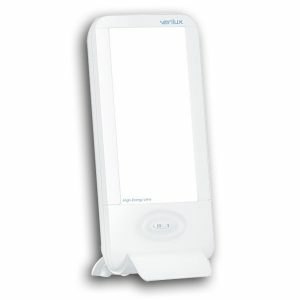 This Natural Energy Light is made by Phillips, the leading name in technology and health. They make hospital-grade imaging equipment, monitoring machines, and just about every other hospital appliance you can think of. They are committed to sustainability and improving the lives of patients and medical professionals everywhere. This lamp looks very much like a piece of hospital equipment. This is unsurprising given the manufacturer. 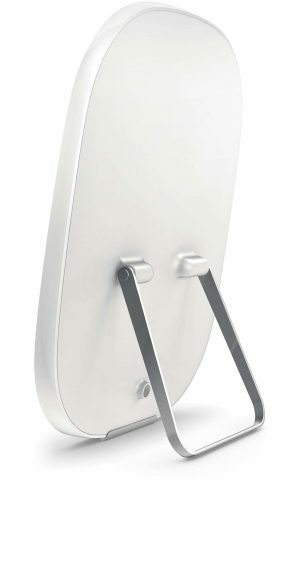 Nevertheless, the unit has clean lines, and is surprisingly thin. It will take up very little space. The soft buttons on the front of the device change the brightness levels. They’re intuitively placed and still make the unit look good. It’s larger than I expected, at 4 x 12.5 x 16” and 6.4 pounds. I was expecting a smaller light based on the picture, but I was pleasantly surprised. It fits well on most surfaces although if you have a small desk you would be best looking at alternatives. As you can see it scored well in our look & design test compared with our other test models. The Philips HF3418/60 is good to use right out of the box. Just plug it in and turn it on. You can easily change between the five intensity settings by using the soft buttons on the front, and the timing indicator light is here as well, letting you know for how long you have used the light. 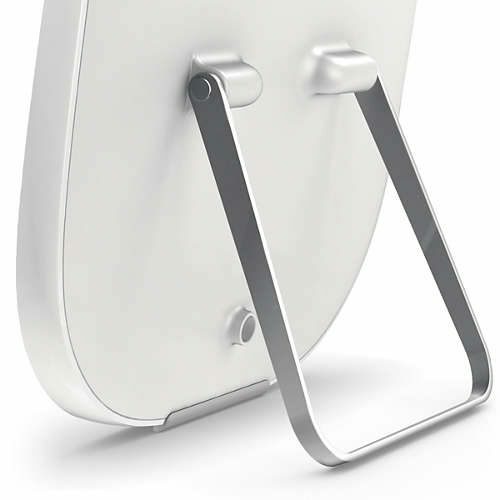 The ‘kickstand’ in the back of the unit allows it to sit on any surface, and you can also mount it on the wall. As you would expect from a product manufactured by Philips, the build quality of this device is excellent. It feels sturdy and the overall quality of the materials both look and feel exceptional. As you can see from the chart above the lamp scored very well in this category. The only thing that let it down was the 2 year warranty. While better than the majority of the competition, it still really lacks behind some of the warranties offered by its competitors such as the Auora LightPad Mini and the Alaskan Northern Lights 10,000. 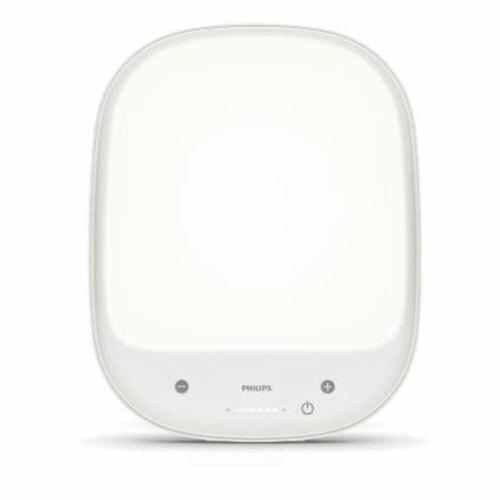 Philips recommends using this light between 20 and 40 minutes a day at about 18 inches from your face. This is a little misleading as the light actually produces around 5000 lux at 16 inches. This would mean to get the recommended treatment of 10,000 lux for 30 minutes you would need to spend over an hour in front of the lamp at 18 inches. 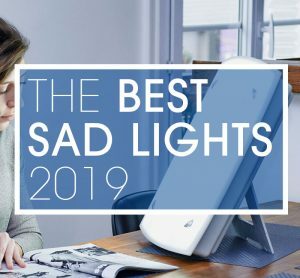 You can sit up to 30 inches away and still get the benefits of the therapy, but you will have to use the lamp for longer to get the same effects. As you can see below it scores right around average in our test which is disappointing considering the price. There’s a row of LED lights along the front of the device which indicated how long you have used the light for. This is not a traditional timer so you cannot set it to stay on for a dedicated amount of time. The different brightness settings actually exceeded my expectations. I thought that the five intensity settings wouldn’t be all that different, but I can definitely tell a change in light level and lux that each setting puts out. You can work up from the lowest setting to the recommended therapy setting without becoming overwhelmed by the brightness of the light. These can be changed by a slider on the side of the lamp, which is a very nice way to handle the light level changes. 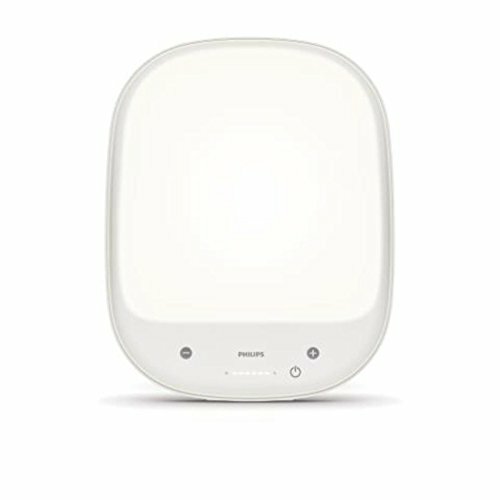 It has LED lights in the lightface, and the diffuser panel over the array blocks 100% of the UV rays. The stand and the angle of the lightface are both adjustable to a good degree, so you can feel comfortable during your treatments. However it cannot be angled downwards which is a big miss and it is not height adjustable. It loses some marks for this. Given the size of this unit, the wall mounting feature is really useful. It can easily and comfortably sit on any surface, but being able to mount it and still have room to do whatever you choose to during your sessions is really handy. Another interesting feature with this lamp is the handy app that Philip published to go with it. It’s a free app you can download to your smartphone. It gives you tips about light therapy, as well as giving you suggestions about each of the light settings available on your device. You can also use the app to track your treatments and sleep patterns. It’s like your own personal coach, right in your pocket. It is also dual voltage meaning so you can either take it with you on your travels (although we do not recommend this due to the size). It also means you can purchase from outside the USA and be confident that it will work with only an adapter plug needed to convert to your local wall outlet. This light was priced at $169 at the time of our review which is in the more expensive range of the lights in our test. Is this value for money? Not for us. we give it a score of 5 in the value for money ratings which is below average. It certainly has features that others in its price range have decided not to include but at this price we expect top level light output and this just doesn’t produce that. Other lights with similar features and comparable light output are available for much less than this model. If this were either $50 cheaper or outputted 10,000 lux at 16 inches or above we would have no trouble recommending this light as a top pick. But for now it just misses out.